Indicted ex-Gov. Rod Blagojevich, a die-hard Democrat, has clearly been an embarrassment to his party. 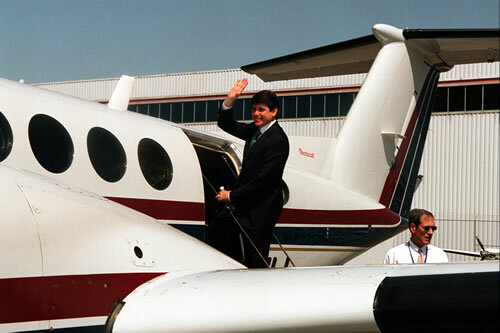 But what’s often lost amid the salacious allegations is that the “Blagojevich Enterprise” – a cynical term dubbed by the prosecution in the April 2 indictment — has been a bi-partisan affair, an equal opportunity for both Dems and Republicans to line their pockets. The indictment includes the names of William Cellini, a Springfield, Ill., businessmen and a leading figure in GOP state politics who is accused of fraud conspiracy, extortion conspiracy and attempted extortion. And lobbyist Robert Kjellander, a former RNC treasurer who Chicago Tribune sources said is tied to an alleged scheme to direct the sale of billions of dollars in bonds to refinance the state’s pension debt and secretly kick back hundreds of thousands of dollars to Democratic financier Antoin “Tony” Rezko. So in reality, there’s probably a better term for the level of corruption here – no offense to the U.S. Atty.Patrick Fitzgerald. It’s called the “Illinois Combine”. rules across party lines to line the pockets of political allies without regard to party affiliation. A combine, notice the lower case “c,” is a very handy if not essential piece of farm machinery. The combine is designed to harvest grain. The Illinois Combine appears to be designed to harvest money and power for the private enrichment for the politically well-connected from the public trough. There are some dangers in operating farm equipment, and combines are no exception. Combines can get stuck in the fields and occasionally can hit a rut and expel passengers. replacement in the US Senate to sell the seat to the highest bidder. make money from his office even before he was elected in 2002. Blagojevich, his brother Robert, and fellow defendants Christopher Kelly and William Cellini are to be arraigned before U.S. District Judge James Zagel on Tuesday. Former Blagojevich aides John Harris and Lon Monk are to be arraigned April 16. Both Harris and Monk reportedly are cooperating with the government. Posted: 4/8/09 at 1:00 PM under News Story.